There are many reasons to get a yearly roof inspection. This is an important review of your roof’s integrity that has the potential to save you thousands of dollars. In fact, many roof inspection services are free. Our roofing contractors are proud to perform such no-cost inspections. This inspection should be performed either right before or after storm season, and prior to any repairs. Every roof should be inspected least one time each year. After all, some roofing repairs have the potential to take a while to complete. It is best to have all the details provided at the outset of the project, and before potential problem areas get worse. Too many homeowners have fallen into the trap of paying a roofing expert to tell them the roof repair job is not feasible. This is the worst possible outcome. 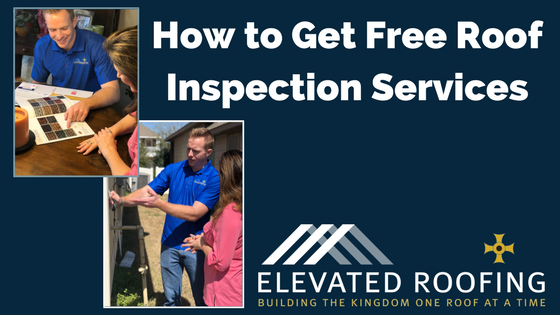 The bottom line is your roofing contractor should be willing to perform the inspection for free in order to earn your business. Opt for a free roof inspection and you will have absolutely nothing to lose. This roof inspection will provide valuable information about your roof and possible repairs needed. Furthermore, the inspection will give the contractor the chance to get a sense of the type of project in question and begin to develop the best possible approach. This is just as much an opportunity for you to learn about your roof as it is for the roofer to get a sense of the looming repair and prove his or her worth. Storm season will be here before you know it. There is no better time to have a free roof inspection performed. If you wait too long, there is the potential the roofing contractor will be too busy with other projects to analyze your roof. Keep in mind roof repairs and roof replacements take some time. If the roofer is overloaded with work due to a string of storms or a particularly strong storm, it will take some time to tend to all requests for inspections. It is better to stay one step ahead and have this important part of your home assessed right away. If you are hesitant to have your roof inspected because you are worried about the process, do not fret! It is extremely easy to coordinate a roof inspection. 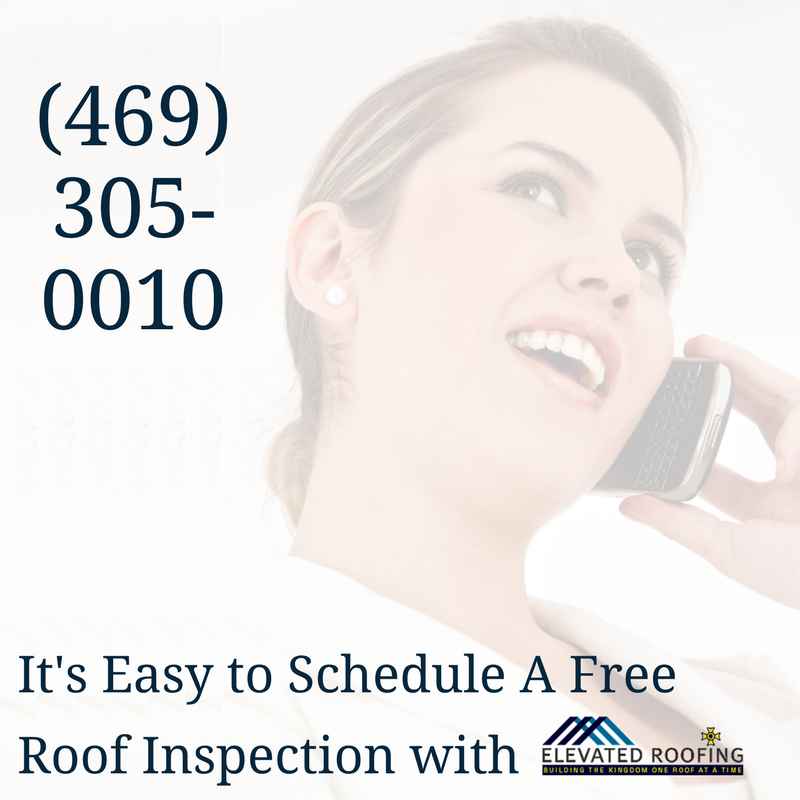 Our roof inspection services team makes this process quite convenient. Simply give us a call, request a free roof inspection, provide your contact information and state why you are interested in the inspection. Once we have this information, the inspection and possible repair process will go that much smoother. 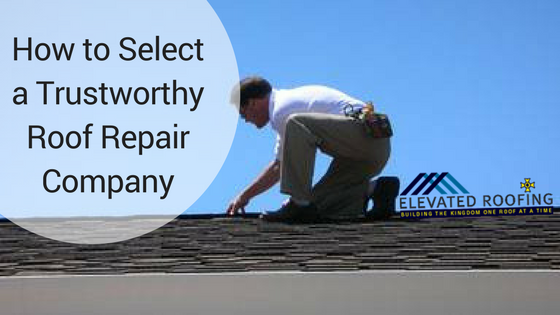 Be specific about your concerns and the roof inspection will prove quick, easy and informative. Lean on our roofing experts to analyze your roof and we will study it in-depth for problem signs that indicate a repair or replacement is necessary. The roofer will look for missing, curling or blistering shingles, missing or cracked caulk by the flashing, rust spots along the flashing, worn or cracked boots by vent pipes, moss and beyond. Reach out to us today to schedule your free roof inspection. This is the perfect time to have your roof inspected as storm season is approaching. It is better to get your roof in tip-top shape before the storms arrive so you do not end up with costly repairs. Our roof inspection services crew will pinpoint any weak points, explain the repair process and get to work as soon as you give us the green light. Give us a call today at 469-305-0010 to schedule the inspection of your roof. (Frisco, Texas – August 2018) – A successful year of growth has landed Elevated Roofing on an annual list of the top 100 roofing contractors in the nation. The Frisco company earned the No. 91 spot on the 2018 Top 100 Contractors List compiled by Roofing Contractor Magazine. Rankings are determined by 2017 sales revenue. Elevated Roofing earned $16.5 million last year. Founded in 2011, Elevated Roofing brings more than 20 years of experience to roof repair, replacement and maintenance. Ninety percent of the company’s work is for residential customers throughout the North Dallas area. They serve numerous commercial clients, as well. “Going the extra mile for customers is important,” says Witte, “so Elevated Roofing offers free roof inspections.” And, unlike some other roofing companies, the business protects lawns, plants, driveways and walkways by cleaning as they go and using high-powered magnets to pick up nails and other roof-related metal objects. In addition to making the top 100 list, Elevated Roofing received a 2018 Customer Satisfaction Award from Pulse of the City News. The company holds an A+ rating by the Better Business Bureau. It is a member of the North Texas Roofing Contractors Association (NTRCA), Frisco Chamber of Commerce, Plano Chamber, McKinney Chamber of Commerce, Allen Fairview Chamber of Commerce and the Lewisville Area Chamber of Commerce. 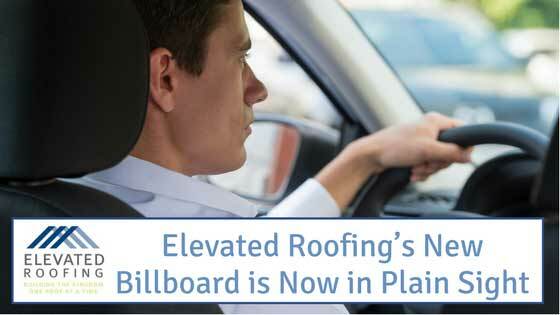 Elevated Roofing is licensed by the Roofing Contractors Association of Texas (RCAT) and is a GAF Master-Elite® Roofer. 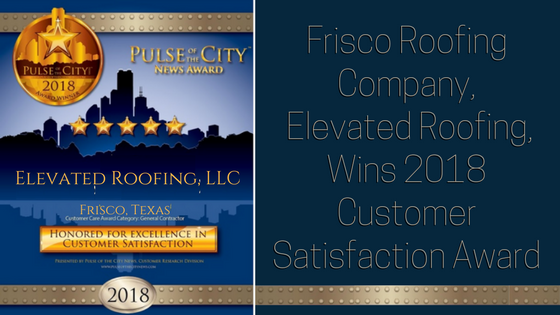 Recently, Frisco roofing company Elevated Roofing, was awarded a 2018 Customer Satisfaction Award by Pulse of the City News. The award recognizes a combination of top design, build quality and superior customer service by local companies. The award “reflects countless hours of research analyzing thousands of customer reviews from multiple sources in an effort to provide vital information to [readers] who are building owners, procurement directors, key estimators and project team leaders in the building and construction industry,” as explained on Pulse of the City’s website at https://business.pulseofthecitynews.com. Elevated Roofing is a premier roofing company, headquartered in Frisco, Texas. The company services residential and commercial properties in the Dallas/Fort Worth Metroplex. Services provided by Elevated Roofing include free roof inspections, roof repair, complete roof replacements, storm & hail damage roof repair, gutter replacement, emergency roofing, and large-scale commercial roofing projects. Pulse of the City News recognizes Elevated Roofing for having “excelled in providing ultimate customer experience,” a reputation that is highly coveted by the management and staff at Elevated Roofing. “We are humbled to be honored by Pulse of the City News for our workmanship and customer satisfaction. We make every effort to offer the best experience to our valued community members,” said Randy Hughes, President of Elevated Roofing. 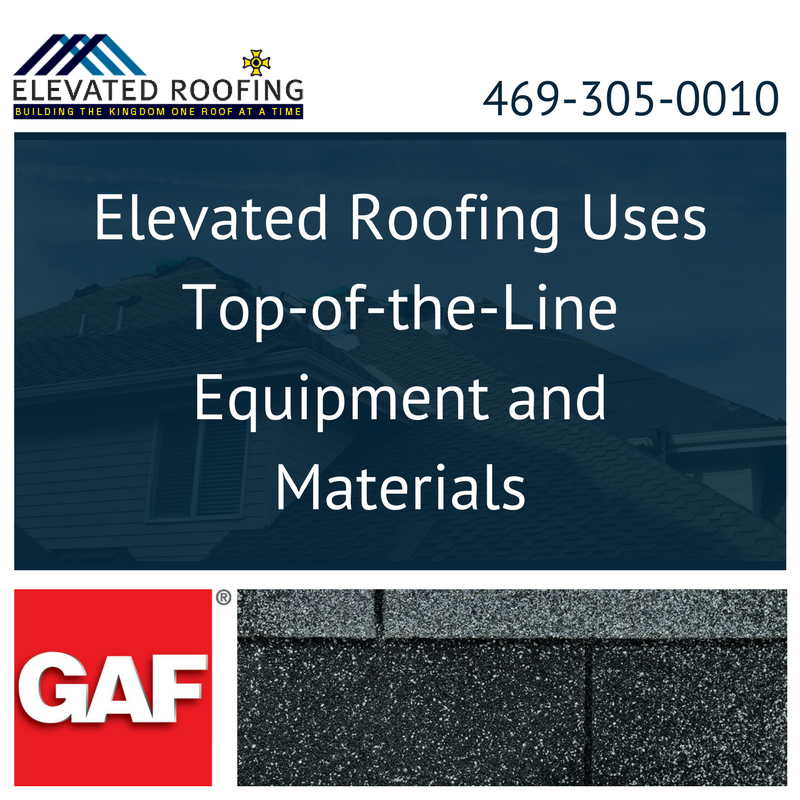 Elevated Roofing is also GAF Master Elite certified, licensed with the Roofing Contractors Association of Texas, and maintains an A+ rating with the Better Business Bureau (BBB). Furthermore, Elevated Roofing is a proud member of the Frisco, Plano, McKinney, Allen, Fairview, and Lewisville Chamber of Commerce. Every commercial roof will eventually require some sort of repair. It might take years, but even the strongest roof will eventually falter in some way. Anything from harsh weather to poor installation, a lack of maintenance or even the roof design can spur the need for a repair. 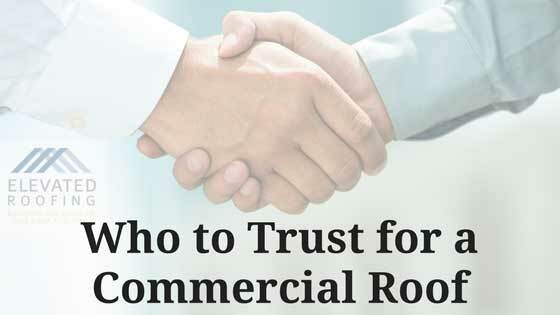 Identifying a flaw needing correction is only half the battle; the other half is selecting a commercial roof repair company worth your trust and respect. 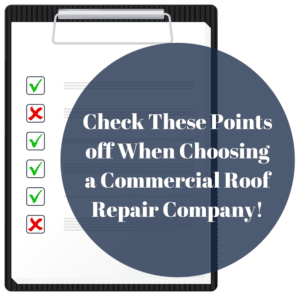 Let’s take a look at some common commercial roof problems and how to go about selecting the best commercial roof repair company. Roof leaks are more common than most prefer. Any type of roof has the potential to leak. A proactive approach to roof maintenance will decrease the chances of water breaching the premises. Abide by a regular maintenance program and you won’t have to deal with the inconvenience and potential financial burden of a commercial roof leak. Roofs sometimes experience billowing, tenting or blow-offs. If the roof is not properly connected to the substrate, any of these unfortunate events can occur. Single-ply style roofs are especially vulnerable to billowing and blow-off. Simple inaction can also create numerous roof problems. The lack of routine roof maintenance is quite common. Have your commercial roof inspected on a regular basis without exception. A roofing expert will identify trouble spots before they become major issues. This is an opportunity to pinpoint spaces where standing water can occur, slipping flashing and so on. Standing water is a serious issue, especially if it remains in place for two days or longer. Idle water that has accumulated on the roof can cause roof damage and a subsequent leak. In the worst case scenario, standing water will cause a roof collapse. This is precisely why you must ally with a proven and skilled roofer who can address drainage issues, perform an in-depth inspection and complete every type of commercial roof repair. You can only learn so much about local commercial roof repair company by reading about them on the web. Speak with current and former customers to gauge their satisfaction with the roofer’s work. Consider visiting the roofing companies to meet the staff and gauge their professionalism. Interact with personnel, try to determine if the staff seems customer-focused and gauge whether they truly value your business. Pay attention to the small stuff while you are on-site. This is your chance to get a feel for how the business operates if they are busy, and whether the staff is welcoming. Do not hesitate to ask to see examples of past work. Examining past projects is your chance to see what your property will soon look like. Check out one or several local projects and compare how they look to those of other roofing contractors. Does the Roofer pay Attention to Detail? Try to determine if the roofing company in question minds the subtleties. Review this document in-depth. Is it professional looking? Does it contain detailed information, drawings or photographs? If there is little attention to detail in this presentation, the same approach will carry over to the actual project itself. You can also get a sense of the contractor’s attention to detail by analyzing prior work. Take a close look at the contractor’s current and previous projects to get a sense of how your commercial property will look when the project is complete. What Should My Roof Estimate Include? Posted by: Elevated Roofing / Tags: Roof Estimate, roof repair, roof replacement / Comments Off on What Should My Roof Estimate Include? Every homeowner should know what, exactly, is involved in a legitimate roof estimate. This way, you won’t ally with a shady roofing company that provides an alleged estimate that falls short of what it really should be. Far too many homeowners are willing to accept an estimate with a dollar amount and little else. This is not to say every single roof estimate should be exactly the same. There will certainly be some differences between each roofing company’s estimates. However, these differences should not be significant. 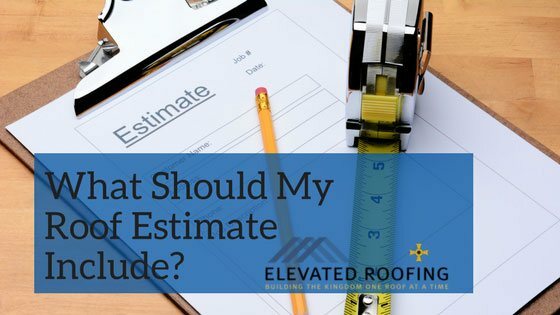 Let’s take a look at what a legitimate roof estimate from an elite roofing company should include. A roof estimate jotted down on a sheet of paper might not be inferior to a typed-out estimate on a couple sheets of crisp paper that recently passed through the printer. What matters most is the content of the estimate rather than its form. As long as the roof estimate contains the critically important elements (including signatures), it will suffice regardless of the form in which it is presented. Every roof estimate should explain which parties are responsible for specific portions of the roof project. If specific aspects of the roofing project will be outsourced to other companies, these parties and responsibilities must be identified in detail within the estimate. The estimate must spell out the project’s start date, completion date and the terms of payment. Every last detail of the payment terms should be explained in-depth. This includes information about down payments, progress payments, and the end payment. Furthermore, the estimate should include a provision for you to hold back the final payment until you are completely satisfied with the job. The roof estimate should include the cost of materials and labor. Even the cost for the pulling of permits should be noted. If the project will result in any sort of debris or a mess of any other sort, the estimate should explain if the roofing company is responsible for the cleanup and removal. The best roofers are willing to explain the type of shingles, flashing, underlayment and ventilation that will be used in the project in extensive detail within the estimate. This information should be highly specific. For example, it should explain the thickness of the underlayment, the locations of the flashing, the type of sealant for areas that mandate waterproofing (nail holes, flashing etc.) and the sizes of the fasteners and nails that will be used for the project. Even the brand of the products that will be used for your roofing project should be noted. The warranties of the workmanship and materials must be presented down to the finest details in the estimate. 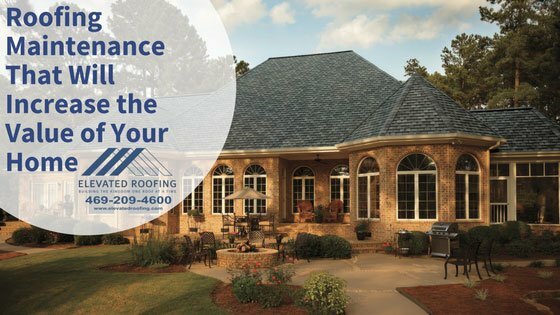 In general, limited lifetime warranties will have excellent protection during the initial years of the roof’s lifespan and be subsequently pro-rated after a certain number of years. 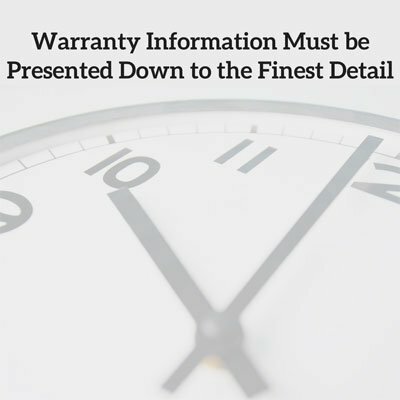 For the most part, a lifetime warranty is generally considered to be half a century. The estimate should state whether the warranty is transferable to a new owner of the property in the event that you decide to sell your home. The ability to transfer the warranty on the roof and workmanship will be a helpful selling point. Proof of the roofing company’s license, liability insurance, and workers’ compensation insurance should be provided in the roof estimate. There should be a lien release that provides you with protection against liability in the event that the roofer does not pay the subcontractors or those who provide the roofing materials for your roofing repairs or replacement. The estimate must include provisions for add-ons or order changes that have the potential to spur additional charges. Every roof estimate should have a well-defined termination clause. This clause should explain the exact reasons why the contractor or you can terminate the agreement without any sort of penalty if the terms of the contract are violated. Just about every homeowner is on a mission to improve the value of his property. One of the best ways to boost your property’s value and appearance is regular roof maintenance performed by true professionals. Even if your roofing maintenance reveals minor issues that can be remedied fairly quickly and at a low cost, getting these repairs out of the way will prevent even larger problems while simultaneously increasing your home’s value. 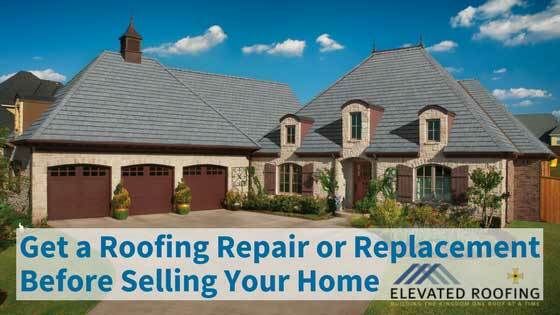 Roofing maintenance is especially important for those who are looking to sell their home. A well-maintained roof free of debris and mold is a major selling point. After all, the last thing prospective home buyers want to worry about is whether the roof over their heads will collapse or falter in some other way. Have your roof repaired, replaced or improved in another manner and it just might make the difference between a low-ball offer and an acceptable offer worth serious consideration. If you are still on the fence as to whether you should invest in your roof, consider the following fact. Homeowners who spend $14,000 for a new roof add such significant curb appeal that they typically increase the asking price on their home by $10,500. This is a 75% return on investment. Add in the fact that you will live in the home for a while before selling it and the investment makes that much more sense. 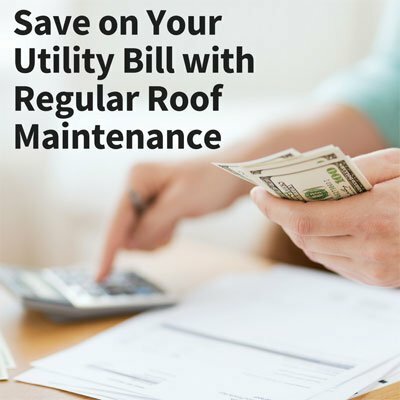 Even if a roofing inspector determines you do not need a full replacement, identifying areas for repair will keep your home cooler and reduce your energy bills. A thorough roof cleaning will eliminate dirt, mold, algae, gunk and other debris that would have otherwise collected heat and moisture. Have these nasty particles removed and your roof’s white or light color will be kept clear to reflect the sun’s rays. As a result, you won’t have to operate your air conditioner as frequently. The ultimate result is significant financial savings. It is quite easy to lose sight of the fact that your home’s roof is all that stands between mother nature and you, your loved ones and your possessions. A regular roof inspection combined with the necessary repairs will ensure your roof is capable of protecting everything you love and value. Do not discount the possibility of your roof collapsing due to weak points that gradually worsen or build up debris. Even slight moisture has the potential to expand into a leak that soaks through your ceiling and onto your valuables. This is a costly problem that takes an abundance of time, money and effort to remedy. You can prevent such a nightmare scenario by having your roof inspected, cleaned and repaired. There is no sense investing in home repairs if a lack of roofing maintenance or roof repairs will sabotage those home improvements. Imagine investing in new flooring, wallpaper and appliances only to have these improvements soaked by a leak stemming from a neglected roof. The bottom line is a poorly maintained roof can result in leaks or even a collapse that sends water and roofing materials into the attic, the interior walls, the foundation and beyond. Have your roof tended to before you invest in other portions of your home so you don’t waste your money. Roofing maintenance extends to the gutters. The best gutters send rainwater away from the home while also adding value to the property. It is possible to upgrade your gutters in a simple way. Consider painting them the same color as your home’s exterior or its trim. Implementing a gutter protection system will prove especially appealing to home-seekers who detest cleaning out gutters. The addition of copper gutters will significantly boost your home’s visual appeal. It is even possible to find low-cost aluminum gutters with a fake copper finish. You can upgrade your home’s current aluminum gutters with a stainless-steel gutter system that stands the test of time. The bottom line is seemingly minor additions can make a significant deal to your home’s look and the perception of prospective buyers. Replace those aged and worn roof shingles and you will add an incredible amount of value to your home. Reliable fiberglass asphalt shingles will provide nearly a 60% return on investment. Or, opt for designer shingles to incorporate some extra special aesthetics for the perfect combination of function and form. This element of visual flair just might be what your house needs to stand out from the rest of the homes on the block and encourage prospective buyers to float out especially high offers. This year, the first full-time employee hired at Elevated Roofing, Zoe Rice, reached a milestone with the company. Rice was hired in 2014 by Mike Witte, owner of Elevated Roofing, who at the time contracted only two part-time salesmen. 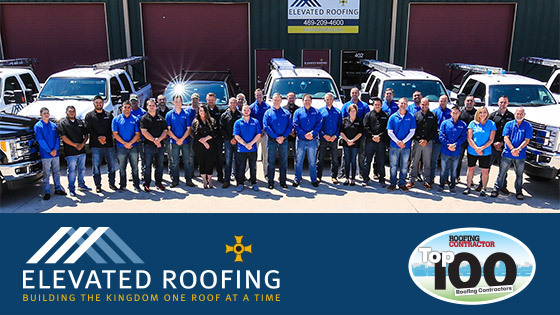 Today, Elevated Roofing is the most trusted roofing company in Frisco, TX with a fleet size of twenty trucks, an in-house teams of roofing and gutter experts, and an impressive GAF Master-Elite certification. Like the company, Rice’s role at Elevated Roofing has also seen change and growth. Rice originally was hired to face-to-face market and develop relationships with professionals in industries who frequently require roofers. However, the company’s success and growth demanded that Rice become more involved, from running the front desk and phones to launching Elevated Roofing into the digital and print marketing space. “In a small business, especially a family-run business, you tend to wear a lot of hats! The motto is ‘when you see a need, fill it!’ so I’ve done a bit of everything,” says Rice. As relationship manager, Rice manages Elevated Roofing’s online and media reputation as well as spends time with the marketing and sales department ensuring that both clients and staff are happy throughout their entire experience. “I don’t want to give too much away, but we are looking at partnering with some local charitable organizations to volunteer as a team. Also, you may soon be hearing my voice on the air during your morning commute offering some practical tips for local homeowners,” Rice gushed.